Yes4, certainly Mrs. Norris5 is a lady! I got Mr. White's6 books7 off today. I didn't see8 the Tribune9 article10 until Friday afternoon, when Mr. and Mrs. Boni11 and Liveright12 and several others from CollirsColliers13 and the Ladies' Home14 arrived with copies of it for the usual Friday tea. Please give Mr. Linscott15 the enclosed photograph16, and tell him that while it is not a very late one, it is rather the best likeness I have, and I would rather use it than a more recent one not so good. I think I can get a new one before the winter is over, but it won't be any better than this. You used this only in connection with my "O Pioneers! "17 and it didn't get very far; people will have forgotten it. If Mrs. Austin18 is really using her 80-horse power brain on me19, oughtn't she to have "The Troll Garden"20? The ordinary reviewer does not matter much, but she is a very thorough person, and if she is going to put her valuable time on me, she ought to have all the data. Please let me know if you sent her that. If not, I'll send you one of my three remaining copies for her. I had rather you forwarded it to her, because she will feel freer if she does not know that I am aware of her enterprize. She may lose her interest and want to drop the subject, you know. On 6 December 1919, Greenslet forwarded to Cather a letter from Kathleen Norris to him that he thought she would "enjoy reading." See also #4070. A large section of Heywood Broun's "Books" column in the 5 December 1919 New York Tribune features an appreciation of My Ántonia, which is, in part, a response to a letter by Lorna Birtwell published in the Tribune's 29 November 1919 "Reviews from Readers." 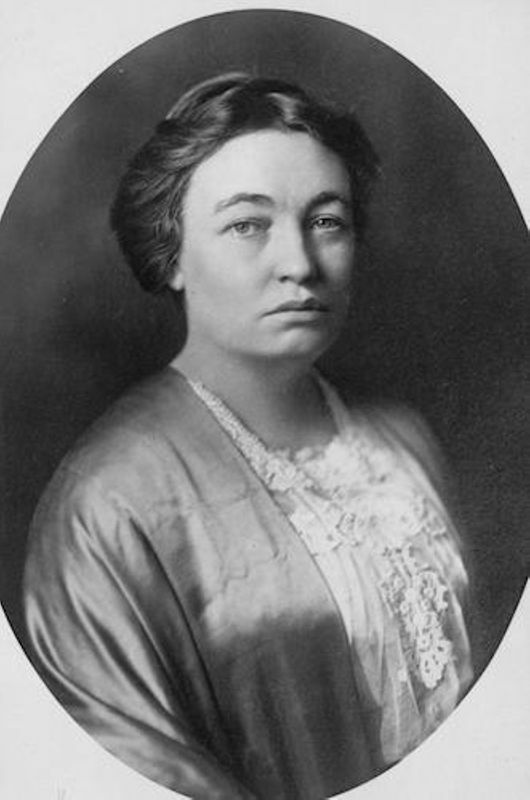 Birtwell's letter noted its real "purpose" was to request that the Tribune "boom Willa Sibert Cather" and bring her more readers. On 4 December 1919, Robert Linscott had written Cather telling her they were out of copies of photographs of her to fulfill requests from newspapers and magazines and asked her for a recent photograph to be reproduced. Which photograph she enclosed is not clear. Norris, Kathleen Thompson (1880-1966). American writer. Born in San Francisco, CA, Kathleen became responsible for her younger siblings when their parents died in 1899. She began writing short stories while working at various jobs. In 1909 she married Charles Gilman Norris, younger brother of novelist Frank Norris, and moved to New York City; they returned to California in 1919. Her stories began appearing in magazines in 1910, and her first novel, Mother, in 1911. Her books quickly became bestsellers; some were made into films and others dramatized on radio. 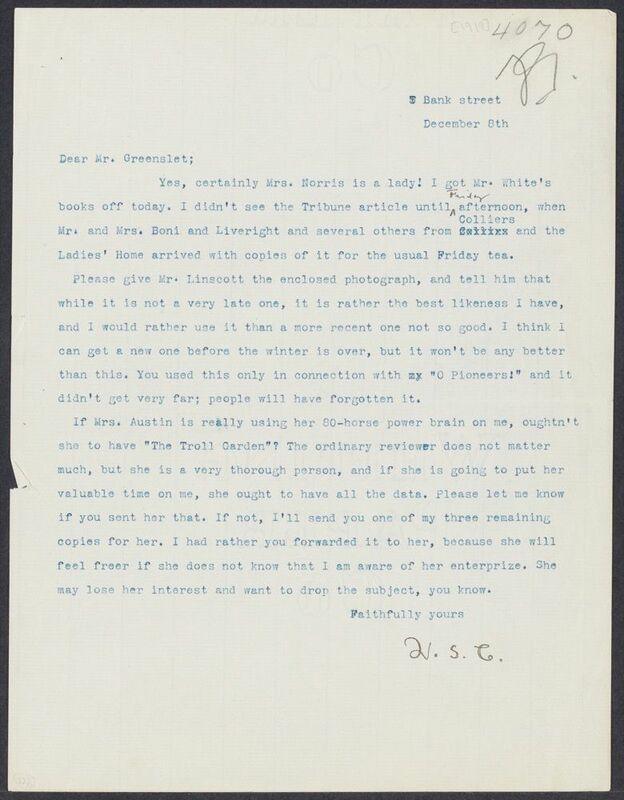 Norris wrote a letter praising Cather’s work, a gesture which Cather appreciated although she noted that Norris’s book sales were much larger than her own. 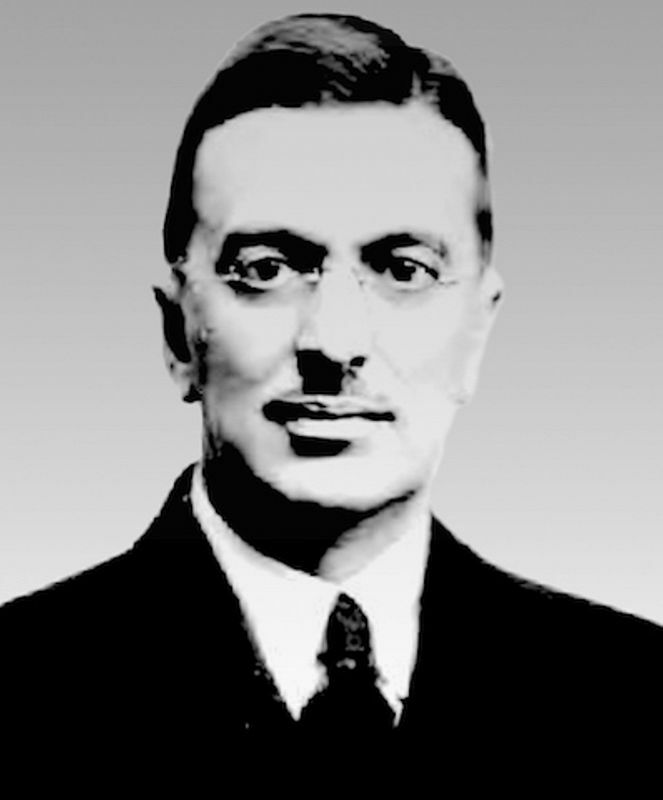 Boni, Albert (1892-1981). American publisher. Albert Boni was born in New York City to successful Russian Jewish immigrant parents. He attended Cornell and Harvard Universities but dropped out to open the left-wing Washington Square Bookshop with his younger brother Charles. They published a popular line of tiny classics, the Little Leather Library. In 1915 he hired a young Dutch widow, Cornelia van Leeuwen, to help with sales; they married two years later and had four children. In 1917 Boni joined with Horace Liveright to form Boni & Liveright, which published many modernist and leftist classics. Boni was forced out in 1918, and in 1923 formed the Albert and Charles Boni publishing firm. He became interested in microphotography and printing and formed the Readex Microprint Corporation in 1939. Cather appears to have known the Bonis socially. Boni, Cornelia van Leeuwen (1888-1985) (“Nell”). Albert Boni's wife. Cornelia married in her native Netherlands and had a son, William, in 1910. After the death of her husband, she and her son immigrated to the United States. 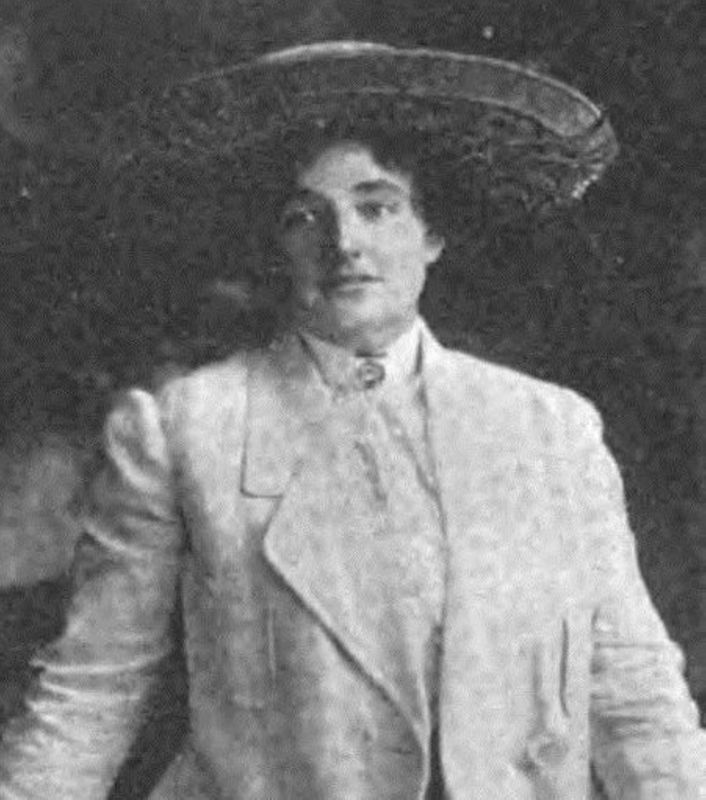 Albert Boni hired her to work in his Washington Square Book Shop in 1915, and they married in 1917. He adopted her son and they had three daughters together. Cather apparently knew Albert and Cornelia Boni socially. Liveright, Horace Brisbin (1883-1933). American publisher. Horace Liveright was born in Pennsylvania, one of the sons of a German-Jewish family. 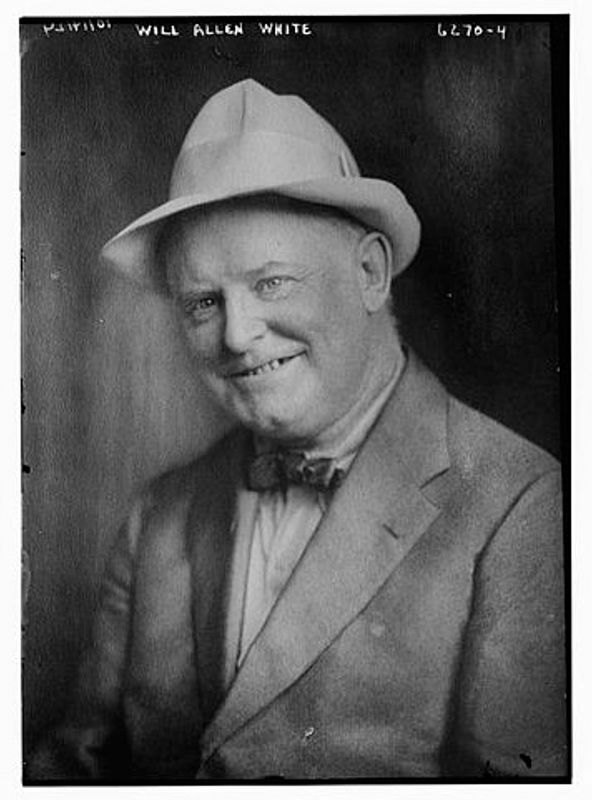 Horace Liveright left school at fourteen, becoming a securities and bond salesman in New York City. His brother Otto K. Liveright also moved to New York City and became a literary agent. Horace married Lucile Elias in 1911; they had two children. After meeting Albert Boni, Liveright convinced his father-in-law to help finance a new publishing firm, Boni & Liveright, in 1917. Liveright bought out Boni in 1918, although his name remained until 1928. The firm published a wide variety of avant-garde authors and used splashy advertising methods. Its influential Modern Library imprint offered moderately priced reprint editions of modern and classic European and American literature. However, ventures in show business forced Liveright to sell the Modern Library imprint to a former partner, Bennett Cerf, in 1925, and Liveright was ousted from the business in 1930. Cather apparently knew the Liverights socially. Liveright, Lucile Elias (1888-1980). Horace Liveright's wife. Lucile Elias was born in Texas and grew up in New York City, the daughter of a wealthy paper manufacturer. She married Horace Liveright in 1911, and they had two children. Her father helped finance Horace Liveright’s ventures, including the publishing firm of Boni & Liveright. Lucille and Horace separated in the early 1920s and divorced in 1928. She later married artist Arthur Emptage. Cather apparently knew the Liverights socially.